With the limited-time increased offer on the Platinum Delta SkyMiles® Credit Card from American Express (that ends April 3, 2019! 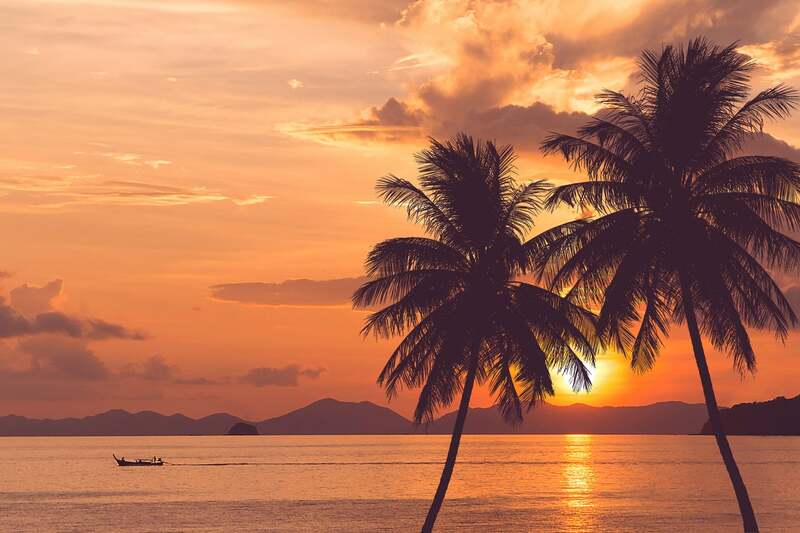 ), you can earn 75,000 Delta miles and 5,000 Medallion® Qualification Miles after spending $3,000 on purchases in the first 3 months of account opening, and a $100 statement credit after your first Delta purchase within the same timeframe. 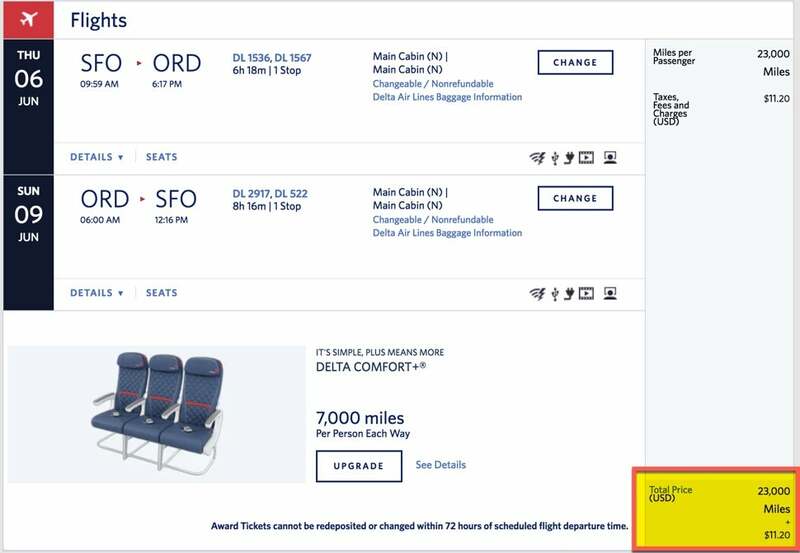 The welcome bonus alone is worth $750 in travel when you redeem your miles using Delta’s Pay With Miles option. And potentially even more if you use them for award tickets on Delta and their partner airlines! Let’s take a look at a number of ways to get the most value from the AMEX Delta Platinum welcome bonus! The Welcome Bonus From the AMEX Delta Platinum Card Is More Than Enough for 2 Round-Trip Coach Tickets to the Aloha State! For a limited time, the Platinum Delta SkyMiles® Credit Card from American Express is offering a welcome bonus of 75,000 Delta miles and 5,000 Medallion® Qualification Miles (MQMs) after spending $3,000 on purchases within the first 3 months of opening your account. You’ll also get a $100 statement credit when you make a Delta purchase within the first 3 months. This offer ends April 3, 2019. Just remember, AMEX only allows folks to earn the intro bonus once per person, per lifetime, on ALL their cards. But because each of the Delta cards is considered a different product, if you’ve had a different Delta card in the past you’re still eligible for this welcome offer. Between the intro bonus of 75,000 Delta miles and at least 3,000 miles from meeting the minimum spending, you’ll have 78,000 Delta miles to use towards award flights. Although Delta no longer publishes an award chart, you can use Delta miles to book Delta flights and flights with partner airlines like WestJet, Air France, KLM, and more! In fact, you can book award flights on many routes where your miles are worth upwards of 2 cents each. 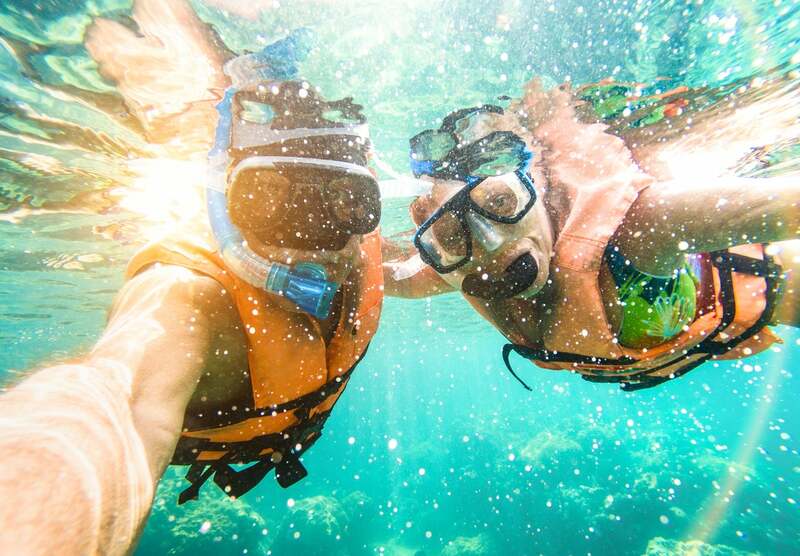 Here are a few great ways to make the most of your Delta miles, to spark your imagination. With the bonus from the AMEX Delta Platinum card, you could get 3 round-trip coach tickets within the US, which cost (on average) 25,000 Delta miles apiece (75,000 Delta miles total). And take a friend or loved one to a popular tourist spot like the Big Apple or the Windy City! This Bigger Bonus Is Enough for 3 Round-Trip Coach Tickets Within the US. 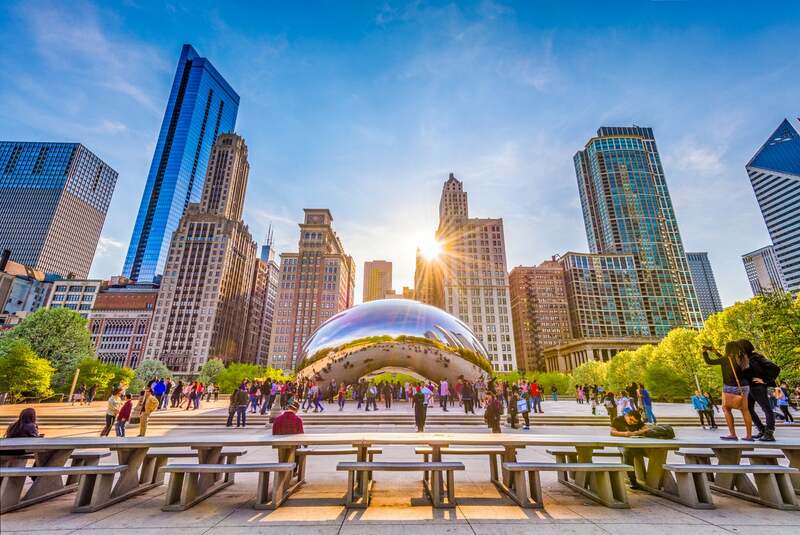 So You and a Friend Could Fly to Chicago for Free! For example, I found a round-trip flight between San Francisco and Chicago for just 23,000 Delta miles in coach. The exact same ticket costs $668 in cash. So using your miles to buy 3 round-trip tickets would save you $2,004, which is incredible. 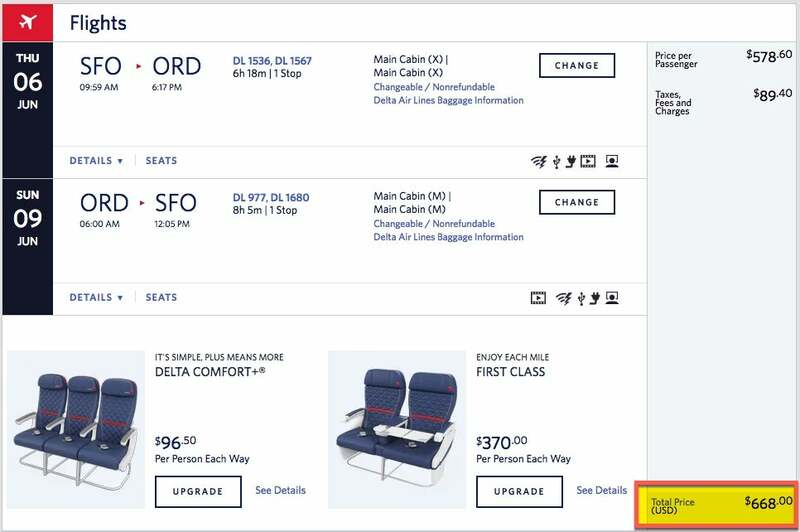 Don’t forget, buying a Basic Economy isn’t so bad when you’re an AMEX Delta Platinum cardholder because you’ll get a free checked bag and priority boarding, which negates the usual downsides to booking Basic Economy tickets. Round-trip coach flights to Europe on can be very expensive when you pay cash! But you can save a ton of money using your miles for these types of expensive tickets. For example, I found a coach flight between Minneapolis and Paris for ~$1,124. But the same itinerary only cost 64,000 Delta miles plus ~$89 in taxes and fees. 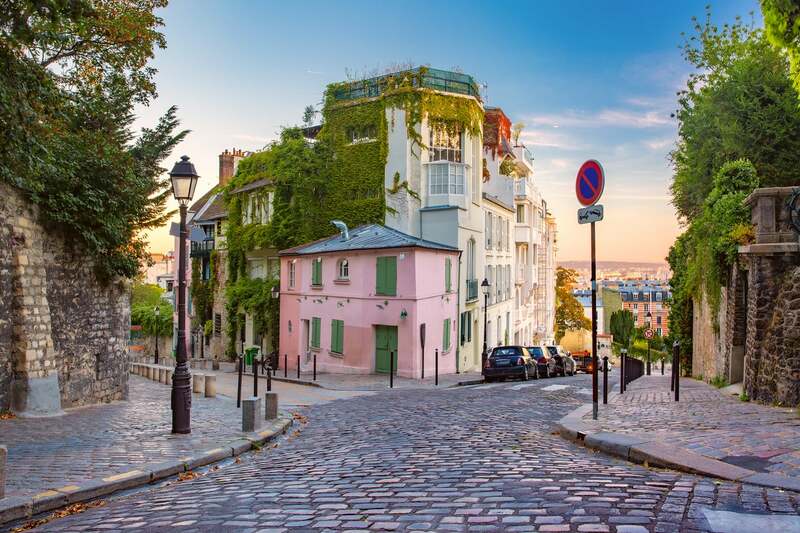 You Can Use Delta Miles to Save $1,000+ on Your Ticket to the City of Light, Paris! That’s getting a value of ~1.6 cents per point (after accounting for the cost of the taxes), and you’d have points to spare from the welcome offer on the AMEX Delta Platinum card! The welcome bonus from the AMEX Delta Platinum card offers more than enough miles to get you and a travel companion to Hawaii for nearly free! 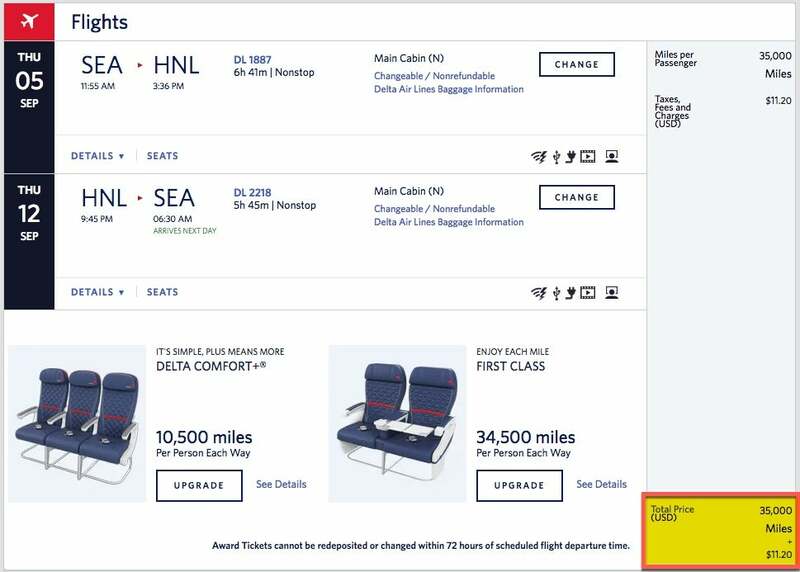 Delta no longer has an award chart, but as an example, I found a round-trip coach ticket between Seattle and Honolulu over the summer for 35,000 Delta miles and ~$11 in taxes and fees. These same tickets cost ~$486 a piece if you paid cash! That means you’re getting a value of 1.4 cents per mile (~$972 / 70,000 miles) from your Delta miles and saving nearly $1,000 in cash! If you have flexibility with your travel dates, you can find great deals on award flights. And if you’re traveling during peak dates, you can save even more when flights tend to be more expensive. For example, I found 2 round-trip, non-stop award tickets from Austin to New York (JFK) over Christmas for 37,500 Delta miles and ~$11 in taxes and fees apiece. But the same flights cost ~$632 each if you pay cash! 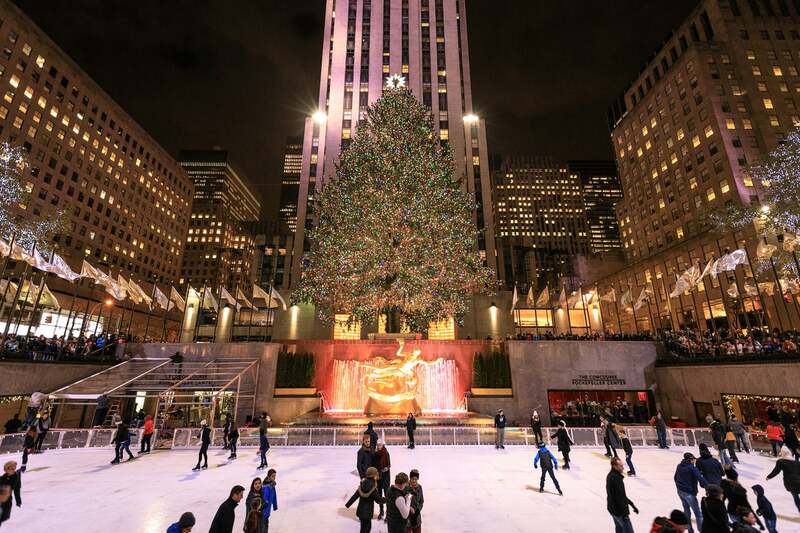 Visiting Rockefeller Center During the Christmas Season Is a Dream for Many! That’s a savings of ~$1,264 for using 75,000 Delta miles to fly during one of the busiest (and most expensive!) times of the year. Not too bad for a single card’s welcome offer! Looking to Earn Even More Delta Miles? Plus, don’t forget that the personal and small business versions of each AMEX Delta card, and the Gold and Platinum versions, are each considered different products. So if you’ve had the personal version, you’re still eligible for the business version. Or if you’ve had the Gold, you can still earn the bonus on the Platinum (or vice versa!). And remember Delta miles never expire! For a limited time, you can earn 75,000 Delta miles and 5,000 Medallion® Qualification Miles after spending $3,000 on purchases in the first 3 months of opening the AMEX Delta Platinum card. You’ll also get a $100 statement credit after your first Delta purchase within the same timeframe. To take advantage of this increased welcome bonus, you must apply by April 3, 2019. At a minimum, you can use the card’s welcome bonus to get $750 worth of Delta airfare. But you can get significantly more value for your miles if you redeem them for award tickets! For example, I found a round-trip coach flight to Europe for 64,000 Delta miles and ~$89 in taxes and fees, that would otherwise cost more than ~$1,124 if you paid cash. And 2 round-trip coach tickets to Hawaii for 35,000 Delta miles a piece, that would cost nearly $1,000 in cash! How do you plan on using your welcome bonus? Let us know in the comments below! For rates and fees of the Platinum Delta SkyMiles Credit Card from American Express, please click here. I have been a member of American Express since1980. Almost all of those years have been with the AE Delta SkyMiles platinum card. I have never earned any type of bonus on that account. A few years ago I earned a miles bonus on a Gold card. I cancelled that card after nearly 2 years. Can I open a new Platinum card and earn a Bonus on it?